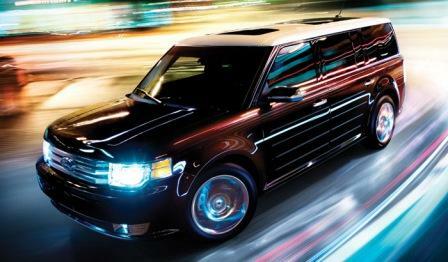 At a first glance… when I initially saw the Ford Flex crossover back in the winter (2008), I was a bit awestruck. I didn’t particularly love the design, but I was more or less intrigued and wanted to find out what it was and which manufacturer was responsible for such a bold and daring design. The external appearance of the Flex grew on me the more I was exposed to the vehicle and had the opportunity to see the different color combinations, and customization options- from my visit to Ford headquarters in Detroit, to several dealerships thereafter, to actually being behind the wheel. So just to bring you all up to speed if you haven’t read about my previous experiences/events regarding the Flex- I paid a visit to Detroit where I met with some of the key designers, marketing/communications and product specialist individuals, (i.e. Flex experts), where I learned everything there is to know about the Flex, and had the opportunity to get my own personal walk-around tour of the vehicle. The passion and enthusiasm for the Flex that was expressed by this dynamic group reverberated through the trip and lingered with me even after I left Detroit. 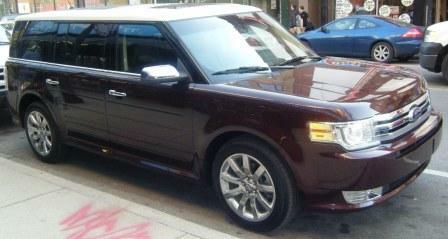 This is the 2009 Ford Flex Limited I drove through Chicago. Being that the Flex seats 6-7 people, it’s definitely a “people mover” so I was able to chauffer various groups so they could really experience the luxurious ride that the vehicle provides. (And the taller people had no problem sitting in the second row- very comfortably I may add with their own footrests, as the Flex was rated best in class for 2nd row limousine-like leg room.) When the Flex wasn’t fully occupied by passengers, I put the 2nd and 3rd row seats down which gave me 10 feet of space to transport everything from suitcases to a grill to shopping bags, so in essence, it’s very versatile, whatever your needs may be. And get this- the 2nd row console houses a refrigerator/freezer! I don’t know about you but I always keep at least a water bottle with me when I drive. In the Flex I was able to keep several in the fridge, all of which kept ice cold as I plodded through traffic, until I reached my destination. Many of you are aware that parking in Chicago is a bear, (no pun intended) but I’m lucky enough to have a [very narrow/confined] indoor structure to park my car. Reversing out of my spot is not a problem with my little RX-8, but I was initially a bit nervous with the Flex as it’s quite a bit longer and I wasn’t sure how well I’d be able to see out of the back window. To my delight there’s a sensor system on the vehicle that not only beeps as you reverse, but also includes a camera, so you can see what’s behind you on the LCD touch screen as you’re reversing! Not to worry, I backed out with ease, sans any dents or scratches. And finally the issue of gas… although prices have dropped as of recently, it’s still a concern for most of us, including me. Given the size of the vehicle, I thought I’d end up spending a more on gas than usual, but that wasn’t the case. For the AWD Limited Flex that I drove, which gets 22mpg on the highway 16mpg in the city, (FWD model get 24mpg hwy/17mpg city), I was delighted at the reasonable cost to fill the tank with unleaded gas, and I didn’t have to hassle with a gas cap because it’s capless! And given that I could also check all nearby gas stations for the lowest prices through SIRIUS TravelLink, my wallet stayed relatively full- well, at least at the gas station. 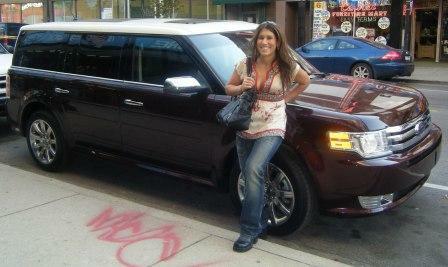 FLEXn through Chicago: CarsDiva, Demetra Markopoulos, in front of the 2009 Ford Flex Limited in Chicago. Overall, whether I was driving, parked, or stopped at a traffic light (yes indeed, I even had a guy on his bicycle ride up to ask about the Flex), I continually received the “thumbs up” sign …people were intrigued. 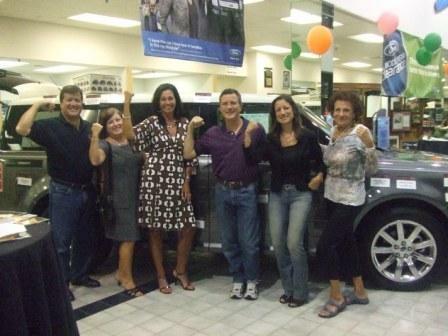 The few that saw the Flex, were somewhat interested, and then took a ride, were impressed. So my conclusion is that you have to get the skeptics in the car to win them over.